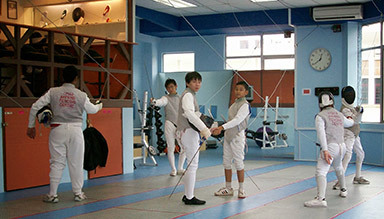 Bekking Fencing Academy has one of the largest and best equipped fencing schools in the region. Fully decked with eight pistes, complete with electronic scoring apparatuses, our fencing masters are able to coach up to 16 students at a time. A gymnasium section is incorporated into the facility for additional physical training. Fencing is a highly physical sport that requires strength, speed and endurance, which regular weight training will enhance. An elevated viewing platform allows parents and visitors to relax while classes are underway. They can easily observe the progress of the students while remaining safely away from swinging weapons. For international students or those who are from out-of-town, we are able to arrange for suitable accommodations in a convenient location. We source and sell all the necessary equipment, from swords to protective gear, that you will require for your training. Our academy is located near restaurants and a shopping mall, where parents can pass the time while their children are training. It is easily accessible via Jalan Ampang and Duke Highway.